This summer has been a treasure trove of exciting things to come for this little regional blog, and I'm thrilled to finally spill the beans on what you can look forward to this Fall and Winter 2015. Tidewater and Tulle is a proud member of the upcoming wedding media collective called Aisle Society. Not just a blogger community behind the scenes, but an innovative website that means big things for the online wedding media world. And heck, with 40 wedding bloggers from around the world who cumulatively have over 10 million followers, AH-mazing things are bound to happen together. Earlier this summer, we have been filming some great wedding education videos for our new YouTube channel! We hope to not just reach a greater modern audience, but also build a library of video goodness. (And for you wedding pros, we're even going to do something special to show how you can use your everyday iPhone equipment to film your very own! You don't have to have a ton of techie stuff to take advantage of SEO's new power player!). Our videos are still being edited, and we're hoping to roll these out this Winter. Now that it's live on The Special Event 2016 website, it must be official! We are so excited to finally share that our Editor-in-Chief/Founder gal Chelsea is headed to Orlando this January to speak on how to get published alongside some of the best wedding blog editors out there! She's also speaking on a second panel about successfully creating a demand for a new service (and wearing her Orchestrated Stylized Shoots hat for this one!) If you're a wedding professional going to TSE, too, be sure to drop her a comment to let her know! Hampton Roads represent! If you love community, weddings, and all that you do with those two as a wedding professional, then now is definitely the time to look into becoming part of our Vendor Guide because we have a lot of exciting things happening exclusively for those amazing people. 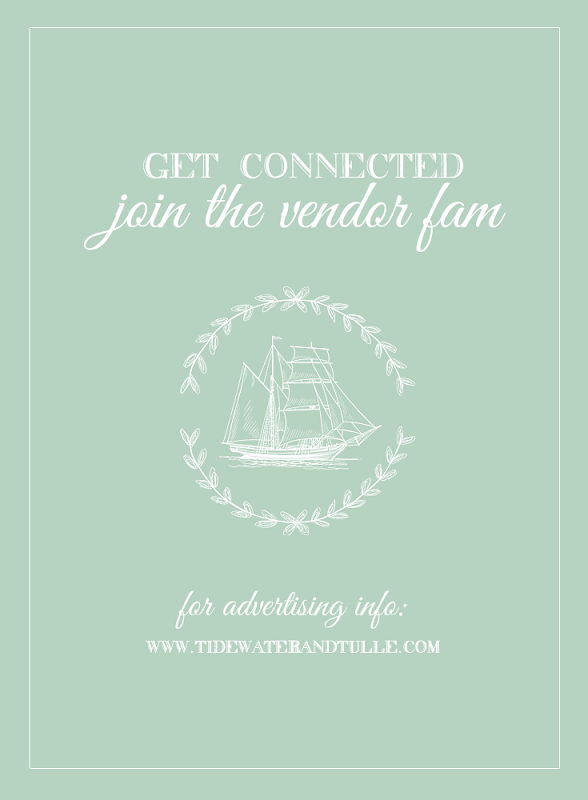 Each and every vendor fam's support helps keep Tidewater and Tulle running, and for that, we are indebted, so Chelsea is always looking for modern and authentic ways for you to connect with each other and to brides and grooms. .... let's just say we have quite a few goodies up our sleeves for y'all! That's right! Our DIY features are coming back! And this time, thanks to our brand new DIY Editor, Stacey Burrus! If you haven't gotten to know her yet, check out our About page. The first DIY is coming very, very soon! You spoke, and we listened! Readers have asked for a chance to stay current with Tidewater and Tulle during their busy days... and so we have started the building blocks for our Tidewater and Tulle weekly newsletter! We are looking forward to sharing exclusive content, special local goodies and events, and so much more just for our newsletter crew later this November. Subscribe today to be the first to be in the know! This is totally short term, but we're headed to the Big Apple TOMORROW for our second year at New York Bridal Fashion Week. We're going to be checking out the best new 2016 ideas from leading gown designers that are available at local bridal boutiques here in Hampton Roads and Richmond as well as celebrating the upcoming launch for Aisle Society! 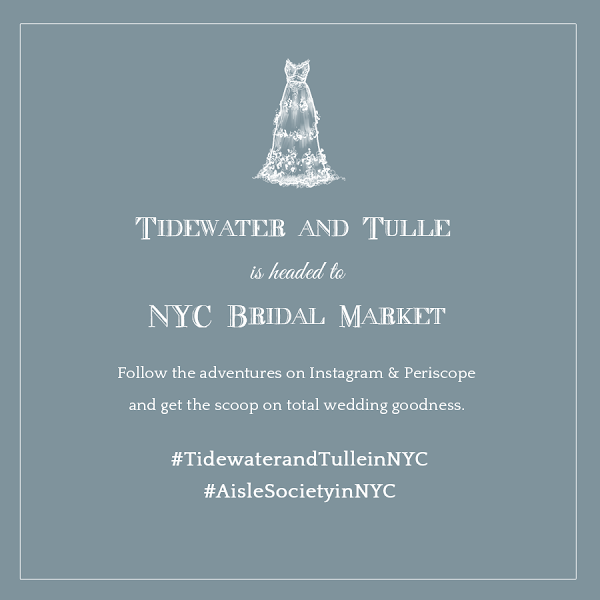 You'll definitely want to stay tuned to our Instagram and Periscope and follow the hashtag #TidewaterandTulleinNYC. Hey, wedding pros! This one is for you! For its third season in a row, we're bringing back our free mini-social media and lunch workshops starting in November. Don't know what Quick Bytes are? You'll want to see the scoops on our past events. And are you early bird? You'll want to save the date for November 17th because that's when we'll be chatting about Periscope in Newport News! This is just the tip of the iceberg, so thank you for being here and continuing to support Tidewater and Tulle with your comments, emails, and social love! We are coming up on our second anniversary this December, and we couldn't be more honored to be the #1 online resource for wedding inspiration here in Hampton Roads and southeastern Virginia in such a short amount of time.